I can't believe that Christmas is almost here. I would like to say that I am ready and prepared, but I won't kid myself, I'm not!! I have a bit to go, and will probably come down to the wire before getting into my car with my hubby to drive to my brother's house to travel and celebrate Christmas. So much to do, so little time. I am trying to make and finish up my Christmas cards that I want to make for my friends and family that mean the most, and wanted to come and share one of those cards with you today. It is a relative simple card, but elegant. I like the simplicity of it, but it packs a beautiful punch too ( if I do say so myself). I have actually repeated this card a few times because it is so simple, and elegant to send to a couple of friends and family already. 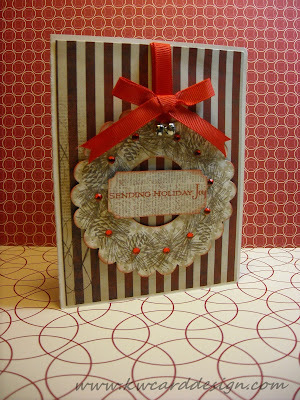 This one I added some mini jingle bells that I bought from SU!, and used the Lost and Found Christmas 6 x 6 paper pad. The stamp comes from Basic Grey, and the sentiment is from the Holiday Lights set from PTI. 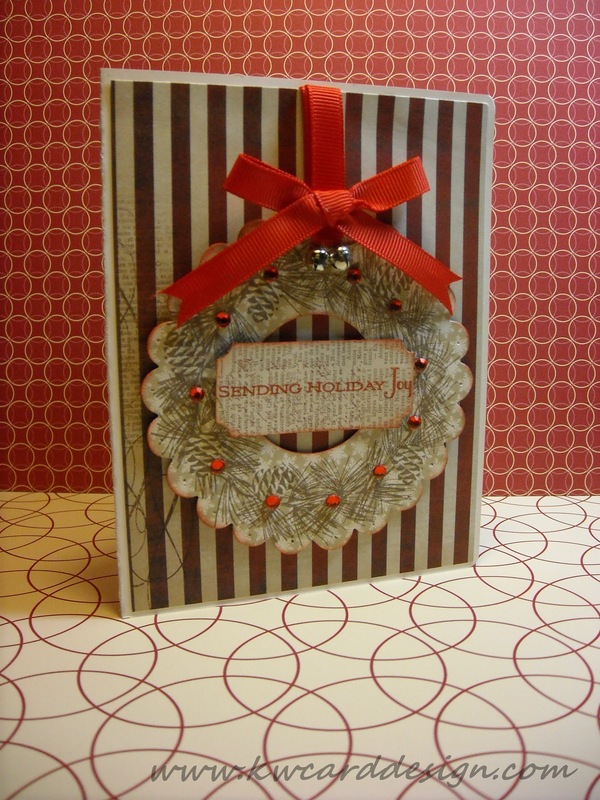 I cut the image using my largest scallop Sizzix Die, and the used my circle cutter to cut out the center. I inked the edges with both barn door and festive berries Distress Ink. It is all put on a Vintage Cream card base from PTI. Hope you all are having success in getting ready for Christmas, and soon to come New Year. I hope you come back when I share with you another paper craft creation! :) Thanks for stopping in! !